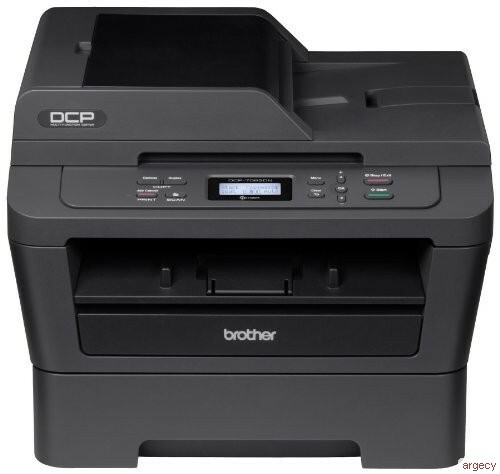 The Brother DCP-7065DN is an affordable laser multi-function copier that is great for making quick copies or printing text-based documents. It features automatic duplex printing for producing two-sided output, and a built-in Ethernet interface for sharing with others on your network. Its 35-page capacity auto document feeder allows for unattended, multi-page copying or color scanning. Plus, its advanced capabilities allow you to scan documents to a file, image, E-mail or OCR. To help lower your operating costs, a high-yield replacement toner cartridge* is available. Easily produce two-sided output. Print professional two-sided documents and booklets using the automatic duplex printing feature. Also, create two-sided output from one-sided originals when copying. This feature helps to reduce paper use and save money. Flexible paper handling. The DCP-7065DN features an adjustable, 250-sheet capacity paper tray for letter or legal size paper. Plus, a single-sheet manual feed slot for envelopes and thicker media. 35-page capacity auto document feeder. A quick and easy way to copy or scan multi-page documents. Convenient mobile device printing & scanning. Print from your mobile device via: Brother iPrint&Scan and Cortado Workplace. Plus, wirelessly scan to your mobile device with the Brother iPrint&Scan app. Outstanding customer support. The Brother DCP-7065DN offers a 1 year limited warranty with free phone support for the life of your product. Unit Dimensions (W"xD"xH") 15.9" x 15.7" x 12.4"
Carton Dimensions (W"xD"xH") 20.7" x 20.1"x 19.4"
Unit Weight (lbs) 25.1 lbs. Carton Weight (lbs) 32.2 lbs. All trademarks, brand and product names are property of their respective companies. Windows Vista, Windows Server and Windows and the Windows logo are trademarks of Microsoft United States and/or other countries. Mac OS and OS X are trademarks of Apple Inc.
"In-box" Consumables/Yield Approximate toner cartridge yield in accordance with ISO/IEC 19752 (letter/A4). Drum yield is approx., and may vary by type of use.